Tomorrow night we’re having a staff summer barbeque. The joke around here is whether or not it still qualifies as summer. I think that mentally most of our employees have decided that it is autumn, whether or not the calendar agrees. Around my house we’ve been enjoying the warm summer weather as the kids jump on their new-to-us trampoline. It has occupied all of their free time this week! Have you ever bounced on one of those big trampolines? It’s quite a workout, at least for this mama. I have a feeling that we’ll get some staff members on there tomorrow, so look for those pictures on our Facebook page, here. Flores is a small Indonesian island. This week’s coffee of the week is new to our store, and it is even new to me. Have you heard of Flores? I’m not sure that I had before we ordered this coffee. 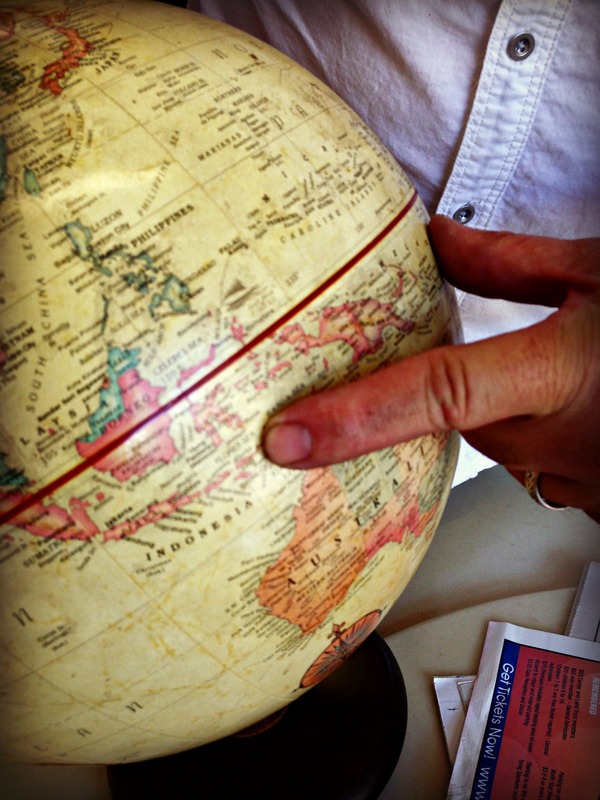 In fact, the picture to the right is Trace showing us the location on our handy-dandy globe. We usually use the globe to educate new employes on coffee-growing regions, but sometimes we need the education! Flores is part of the west Indonesian archipelago. A brief disclaimer: I got some of this information from the official tourism website of Flores, here, so if you would rather read it for yourself, follow the link. It is a neighbor to Komodo, island of the famous Komodo dragon, and there are Komodo dragons to be found on West Flores. The island is located to the east of Bali, and has the same kind of stunning beauty. Specialty coffee is new to Flores. For years the local farmers grew and processed their own coffee, selling it in mixed lots at a low price. Only recently has the processing improved, and now there are seven farmer groups that are certified organic and wet-processing their coffee for export at a better quality and a better profit. We roasted this Organic Island of Flores coffee yesterday, and immediately brewed up a french press to try it. The first two adjectives that came to mind were “bold” and “nutty.” I know that we use those words a lot in reference to Indonesian coffees, but it was true again. It’s full-bodied and easy to drink as an afternoon pick-me-up, if your day has stretched long, as mine has. I know that I like a coffee when I have another cup after my morning brew. I hope that you all enjoy your weekend. Come on in and try a cup of this Organic Flores on us by using the code Komodo dragon* this week. If any of you have been to the Island of Flores, I’d love to hear about it. Send me an e-mail or leave a note on our Facebook page. I love learning about new regions. Enjoy! *Code good for one free 12 ounce cup of Organic Island of Flores. Code expires on 9.19.13. Limit one free cup per customer please. Valid only at Carolines Coffee Roasters, 128 S. Auburn Street, Grass Valley, CA. Code/Offer has no cash value.